Catch up tickets for the conference are now available! Founder of the London PMS and Menopause clinic, Professor John Studd, Consultant Gynaecologist and a world leading expert in the treatment of hormonal & premenstrual disorders will be presenting the Keynote address on the common misdiagnosis of PMDD as Bipolar Disorder. Co-Founders Amanda LaFleur & Sandi MacDonald CLFE will present an overview of PMDD and IAPMD and how to be an advocate for your own health. Dr Tory Eisenholr-Moul PhD will live stream from the USA to help you understand your treatment options. 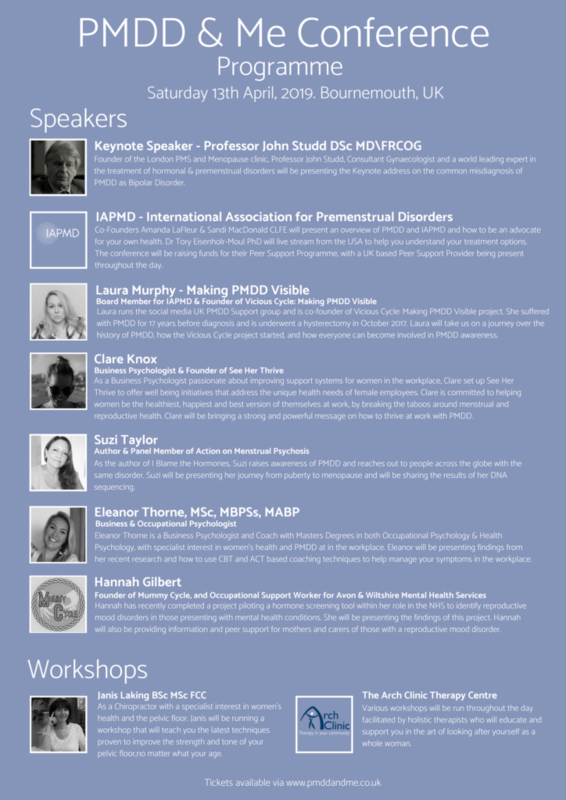 The conference will be raising funds for the IAPMD Peer Support Programme, with a UK based Peer Support Provider being present throughout the day. Bio: International Association For Premenstrual Disorders is a not-for-profit organization providing education, support, advocacy, and resources for those affected by Premenstrual Dysphoric Disorder (PMDD) and Premenstrual Exacerbation of underlying disorders (PME). hysterectomy in October 2017. Laura will take us on a journey over the history of PMDD, how the Vicious Cycle project started, and how everyone can become involved in PMDD awareness. Bio: Laura is a Board Member for IAPMD & Founder of Vicious Cycle: Making PMDD Visible. Vicious Cycle is a grass-roots project, passionate about raising the standards of care for sufferers of PMDD (Pre-Menstrual Dysphoric Disorder) and extreme PMS. As a Business Psychologist passionate about improving support systems for women in the workplace, Clare set up See Her Thrive to offer well being initiatives that address the unique health needs of female employees. Clare is committed to helping women be the healthiest, happiest and best version of themselves at work, by breaking the taboos around menstrual and reproductive health. Clare will be bringing a strong and powerful message on how to thrive at work with PMDD. Bio: Clare is a Business Psychologist and Founder of See Her Thrive. Passionate about improving support systems for women in the workplace, she set up See Her Thrive to offer wellbeing initiatives that address the unique health needs of female employees. Clare is committed to helping women be the healthiest, happiest and best version of themselves at work, by breaking the taboos around menstrual and reproductive health. Her distinction level research on women's experiences of PMDD in the workplace has been nominated for an Indigo Gold Award and will be published in 2019. As the author of I Blame the Hormones, Suzi raises awareness of PMDD and reaches out to people across the globe with the same disorder. Suzi will be presenting her journey from puberty to menopause and will be sharing the results of her DNA sequencing. Eleanor Thorne is a Business Psychologist and Coach with Masters Degrees in both Occupational Psychology & Health Psychology, with specialist interest in women's health and PMDD at in the workplace. Eleanor will be presenting findings from her recent research and how to use CBT and ACT based coaching techniques to help manage your symptoms in the workplace. Eleanor Thorne is a Business Psychologist and Coach with Masters Degrees in both Occupational Psychology from Goldsmiths University and Health Psychology from King's College London. Eleanor's background is in both HR and academia which givers her the ability to approach organisational challenges from both an evidence based and practical business perspective. She is passionate about well-being in the workplace and has specialist knowledge in women's health at work. She has published scientific articles in the topic of the menopause in the workplace and is currently carrying out research in the area of Premenstrual Syndrome and Premenstrual Dysphoric Disorder in the workplace. Eleanor is the founder of Example Coaching and uses person-centred approach to help individuals achieve their goals and to live a more fulfilling values-based life. Eleanor specialises in business, performance and health coaching using evidence-based CBT and ACT techniques. Hannah Gilbert - Screening tools for PMDD will it work? Hannah has recently completed a project piloting a hormone screening tool within her role in the NHS to identify reproductive mood disorders in those presenting with mental health conditions. She will be presenting the findings of this project. Hannah will also be exhibiting information and peer support for mothers and carers of those with a reproductive mood disorder through her peer led support group; Mummy Cycle. I am the founder of Mummy Cycle, a peer led support group that supports mums of children all ages that have a reproductive mood disorder. We are the first mum group of its kind, we also support carers and raise awareness of reproductive mood disorders. Clinically I work as an Occupational Therapist Support worker for Avon and Wiltshire Mental Health, I have been clinically trialling a hormone screening tool in our services to identify if there is a reproductive mood disorder present, this is not a tool for diagnosis but a tool to help elimate a mental health diagnosis and establish the current treatment plans for individuals. As a Chiropractor with a specialist interest in women's health and the pelvic floor. Janis will be running a workshop that will teach you the latest techniques proven to improve the strength and tone of your pelvic floor, no matter what your age. Various workshops will be run throughout the day facilitated by holistic therapists who will educate and support you in the art of looking after yourself as a whole woman. There once was a woman. We'll call her Alice. After a long hot summer the autumn came and the dandelions disappeared. Exhausted, Alice slept until the spring. She sat in her garden one morning and out of the corner of her eye she saw a dandelion. Feeling devastated se decided to take action. She spoke with her neighbours and convinced them to tend to their own gardens because she believed the dandelion seeds were coming from them and their lack of due care and attention. Reluctantly they agreed, and yet the dandelions kept coming. Alice's life became completely engrossed in getting rid of the dandelions, so much so Alice forgot to tend to the rest of her garden and the flowers slowly wilted and died. Thank you for your letter regarding your dandelions. After much consideration we have consulted with the leading experts and sought opinions from the most experienced gardeners and have come to a conclusion. We advise you to learn to love your dandelions. And so Alice did just that. It wasn't easy, and some days Alice couldn't help but pull up all of her dandelions, but over time Alice learned to love her dandelions and see the beauty in all that grew in her garden.